Custom cakes, classes, cupcakes and over-sized cookies. Consultations for a customized cakes and baked goods. When buying a minimum of 3 cupcakes, City Cakes will give you one free! Nestled into the lower level of a New York City brownstone building, this tiny bakery is easily overlooked. 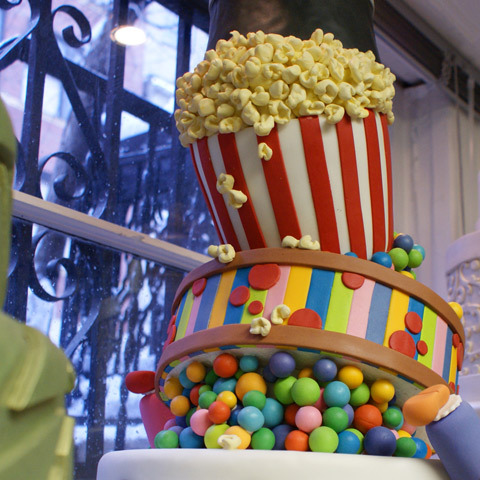 City Cake's designers, Benny Rivera and Marc Matthias, handcraft special occasion theme cakes along with some of the finest artisan cupcakes and cookies in Chelsea. Rising to every challenge, Rivera and Matthias have been featured in competitions such as TLC’s Fabulous Cakes, and the A-list with Mark Ruiz. Luxuriant chocolate cakes and icings are made with fine Scharffen Berger and French Valrhona couverture. Everything is freshly baked on the premises using choice ingredients. City Cakes playful designs, combined with their specialty recipes of uncommon cake and icing flavors is what distinguishes them from other bake shops. Popular cupcake flavors include salted caramel, chocolate butter-cream and red velvet. They also offer beginning and advance cake design classes for those who are interested in baking their own specialty cake like a pro. When purchasing a minimum of three cupcakes, City Cakes will give you one free!